A while ago I got a ping from The Man in the White T-Shirt, asking whether I'd like to join him for a special lunch. Apparently Godenya (ごでんや) is doing a guest chef/pop-up featuring Japanese eel, and knowing how much I love Japanese eel, he thought I'd be game for it. Well, the timing was a little awkward, and it would mean not having a regularly scheduled lunch and dinner, but as I've turned down a number of his invitations lately, I figured I'd better accept this particular one. I've never been to Godenya even though a number of friends have told me about it. The place is pretty much a hole-in-the wall... One needs to walk down a back alley and enter through an unmarked back entrance of an old building, and besides the street number - which was not visible anywhere - the only hint that there was a Japanese restaurant was the presence of white noren (暖簾) above what turned out to be a wooden sliding door. Today's meal is a one-day pop-up by Ryo (翏), a restaurant specializing in eel in Naka-meguro (中目黒), Tokyo. 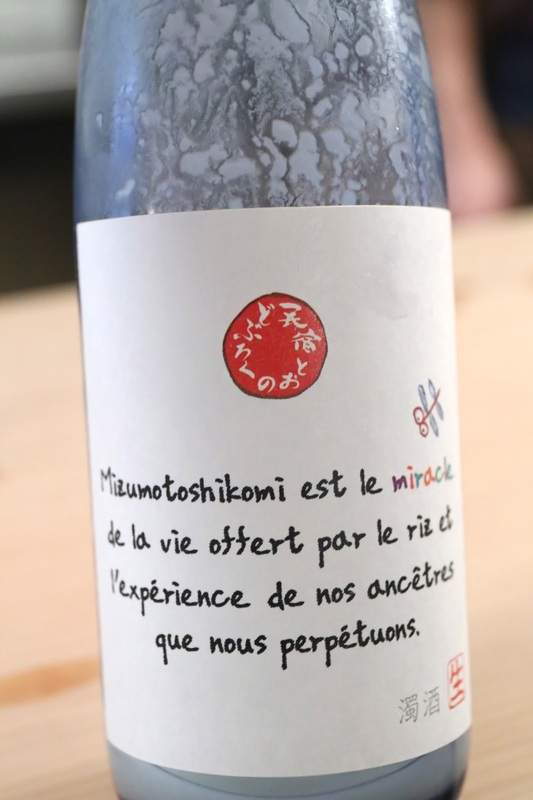 The young chef and the lady who "kinda feels like a wife" from the restaurant were in charge of the kitchen, while master of the house Goshima Shinya (五嶋慎也) took care of the sake pairings. The eels are wild, and comes from Hachirogata (八郎潟) in Akita Prefecture (秋田県). The ones today weigh around 1.2kg. This is the best season for eel as they are at their fattest, and soon they will swim out to the ocean in winter and disappear. 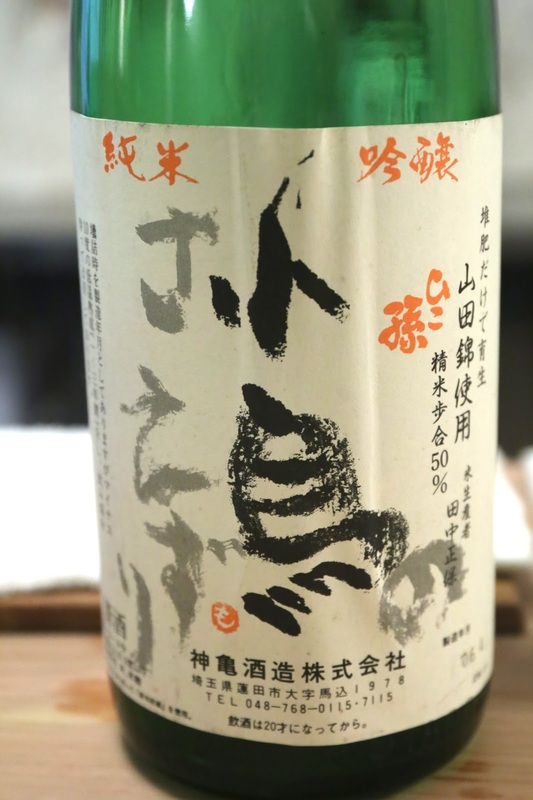 Minshuku Tono White Label Doburoku (民宿とおの 白ラベル どぶろく), 2015 - our welcome drink. With the lees and rice still in the bottle so it was very lumpy... Still bubbling and fermenting. Can taste the alcohol and it was a little bitter on the palate. Made by a bed-and-breakfast (民宿) in Iwate Prefecture (岩手県) from rice grown with no chemicals or pesticides. Eel yam somen (鰻 長芋そうめん) - a beautifully presented first course. We mixed up the ingredients before digging in. The grilled eel was accompanied by maitake (舞茸) mushrooms that have been dried for a long time, and sits on a bed of thin "somen (そうめん)" made of Japanese nagaimo (長芋). Garnished with grated wasabi (山葵), ginger, and a sprinkle of perilla (紫蘇) flowers. Beautiful, delicate flavors worked in harmony. 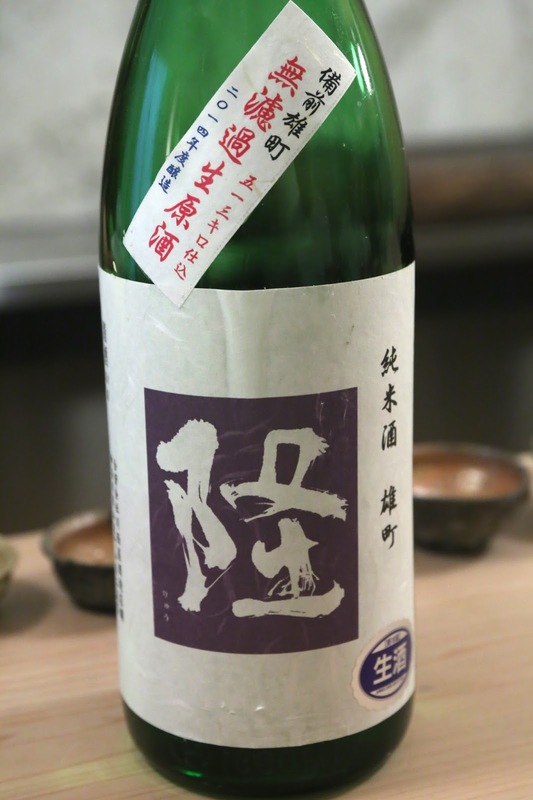 Sougen Junmai Hattannishiki Unfiltered Namagenshu (宗玄 純米八反錦 無濾過生原酒), 2015 - served at 20°C. Seimaibuai (精米歩合) of 65%. Round on the palate, a little viscous. Slighty dry and spicy (辛口) but overall more on the sweet side (甘口), smooth but with a kick on the finish. Good depth of flavors. Nose has a hint of fermented beans. Eel and eggplant Prosciutto roll (鰻と茄子 生ハム巻き) - this was real interesting. I jokingly asked if there was actually any eel on the plate... underneath that pile of scallion sprouts (芽ねぎ). Picking out the sprouts revealed the different layers: thin slices of Prosciutto on top, followed by eggplant, and finally the eel at the bottom. We were told that the orange sauce has peanuts inside, which I was able to distinguish, but... would the chef get offended if I said that the sauce reminds me of Thousand Island dressing?! 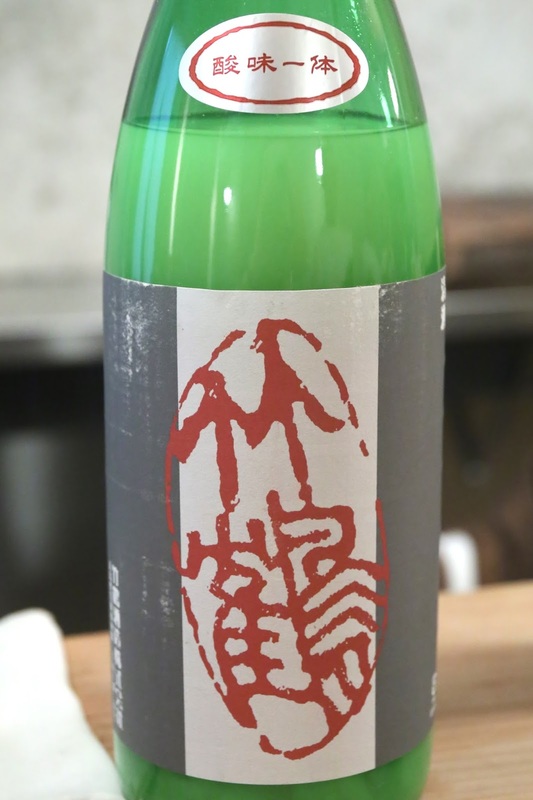 Ryu Bizen Omachi Tokubetsu Junmai Nama (隆 備前雄町 特別純米 生), 2015 - served at 21°C. Seimaibuai (精米歩合) of 60%. Bigger on the palate, more acidity up front, but a little spicier on the palate. Alcohol was sharper and a little piercing up the nostril. Very fragrant, almost wood-like. Eel filet, liver, bone (鰻 ひれ巻き 肝焼き 骨煎餅) - such beautiful simplicity. The fragrance spread from the kitchen long before our plates arrived. The skewer of grilled eel filet was covered with a layer of shaved white truffle. We joked about the term "eel filet" and wondered which part of the eel does not qualify as filet... This was very nice and tasty. The liver was very tasty, but a little too salty for me. The deep-fried bones? Simply amazing. I wanted to take 2 bowls of these and just munch on them. 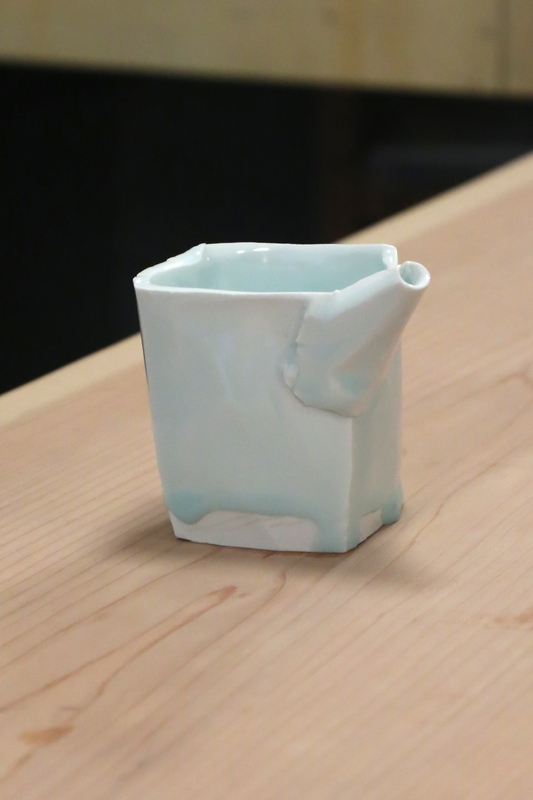 Just sake and eel bones... that's all I need. 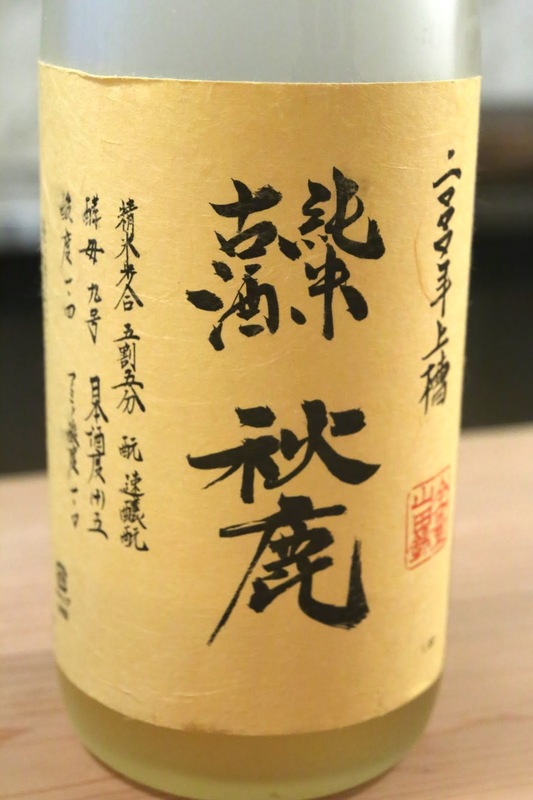 Kotorinosaezuri Junmai Ginjo (小鳥のさえずり 純米吟醸), 2006 - served at 47°C. Seimaibuai (精米歩合) of 50%. Can definitely feel the alcohol as the sake goes down due to the warm temperature. Sweet on the attack but spicy mid-palate, then with a bitter finish followed by a sweet aftertaste. Eel orange liqueur grill (鰻のオレンジリキュール焼き) - we joked about the "chocolate powder" on top of the eel, but in fact it was a powder made with Hatcho miso (八丁味噌) and mirin (味醂), dried for over 5 hours. Sprinkled over the eel, the chef jokingly called it "tiramiso". Wonderfully rich flavors, but I couldn't taste any trace of orange liqueur in the eel thanks to the overpowering miso. Served with sweet sea urchin on top of persimmon slices, as well as ribbons of Manganji pepper (万願寺唐辛子). Eel kabayaki (鰻の蒲焼) - the classic preparation of grilled eel with sauce. So simple, with just enough sauce so that it wouldn't cover up the natural flavors. I could taste the natural sweetness of the eel, and a tiny dab of wasabi helped neutralize the hint of muddy flavors inherent in the eel. Beautiful. 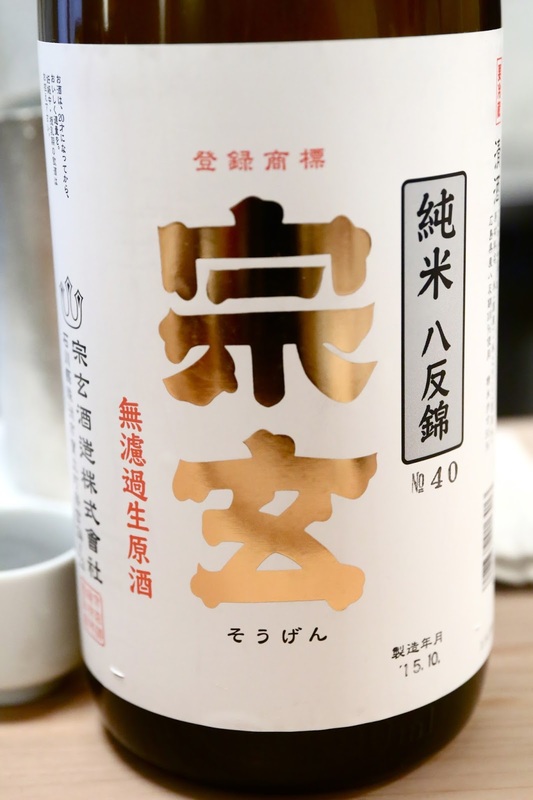 Yorokobigaijin Yamahai Shikomi Junmaishu Unfiltered Nama Akaiwa Omachi (悦凱陣 山廃仕込純米酒 無濾過生 赤磐雄町), 2015 - served at 50°C. Seimaibuai of 68%. Very mild taste. Slightly on the acidic side, but very smooth and very pleasant. Easy to drink. Wild eel simple grill (天然鰻の白焼) - the other classic preparation of steaming followed by grilling without the sauce, typical of the Kanto (関東) region. Taken simply with a dab of wasabi to enhance the natural flavors of the eel. Akishika Junmai Koshu (秋鹿 純米古酒), 2000 - served at 48°C. Seimaibuai of 55%. Salty and mineral, but without the sweetness of Shaoxing wine (紹興酒). Love the oxidation. Lovely golden color. Lifting up the layer of beef revealed the two layers underneath - bluefin tuna from Oma (大間), and grilled eel at the bottom. It's amazing how all three ingredients just melded together in terms of their flavors, and I could just barely pick out the tuna. 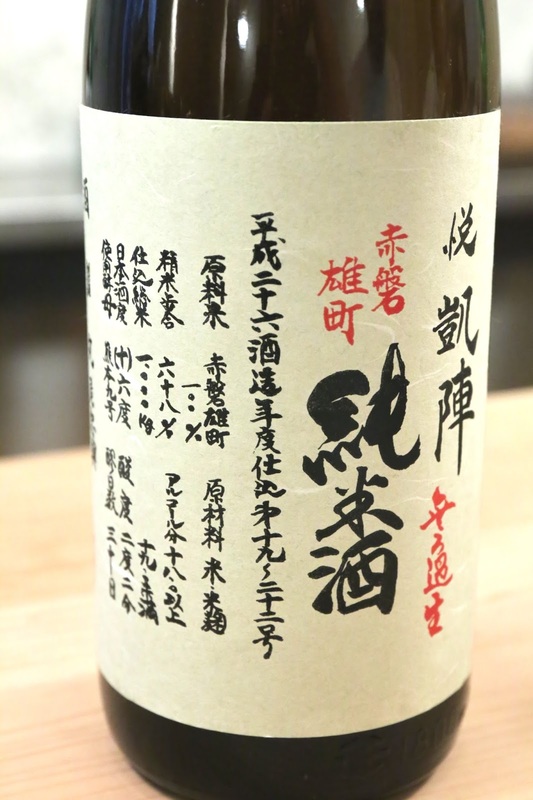 Tenyurin Tokubetsu Junmaishu (天遊琳 特別純米酒), 2003 - served at 47°C. Seimaibuai of 55%. Also oxidized and showing salty plum on the nose, but sweeter on the nose and palate. Wild eel soup (天然鰻のスープ) - made with the head of the eel, along with eel bones, kelp (昆布), sake, and a little Armagnac. This was a pretty unique experience. I love Japanese eel, and I'd never had it so good. Seeing a young chef applying his creativity using high quality ingredients, and delivering dish after dish full of harmonious flavors on the palate... I can't begin to describe the satisfaction I felt today. It looks like I'll have to pay Ryo a visit on my next trip to Tokyo.